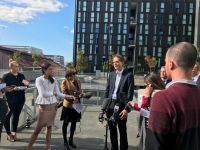 The University of Tasmania announced today a major project to meet future demand for student accommodation. · Work on a range of options with a view to provide 150-200 new beds for Semester 2 this year. Those discussions are commercial in nature and details will be provided as arrangements are finalised. University of Tasmania Vice-Chancellor Professor Rufus Black said the initiatives were part of the institution’s ongoing commitment to provide infrastructure to support student needs and experience. The announcement is in the wake of a gathering of government, civic and community leaders, which committed to address the housing market challenges that are causing supply issues across Hobart. Professor Black said the University would contribute to the community response both as a driver of demand for student accommodation and through the expertise of researchers with related disciplines such as demography and public policy. “Hobart’s growing pains are the result of positive things: more people wanting to come here to live, study and visit,” Professor Black said. “We think with the right ideas and approaches these challenges will be overcome. “The University has played, and will continue to play, an important role in attracting investment which supports Tasmania economically and socially. “By accurately tracking market demands for both students and the broader community, we can provide a strong guide for future private investment in the city. It proposes a range of short-, medium- and long-term measures to respond to the housing market challenges.